The Rule of 72 is popular because it does not require any fancy Greek symbols, advanced math, or complex functions. Behind the scenes there is some interesting, higher level math going on, but figuratively speaking one doesn’t need to know how the car is built in order to drive it. It’s a handy mental shortcut and an easy concept for investors to understand when explaining the significance of the relationship between risk tolerance, time horizon, and required return—essential for any goals-based plan. At its core, the Rule of 72 is another illustration of the power of compounding returns. 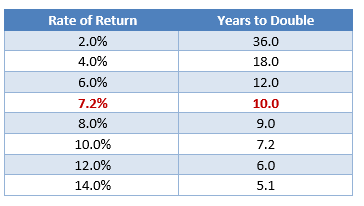 Looking at a range of returns, we can see how long it would take an investment to double at different intervals. A key number to remember is 7.2%. At a 7.2% annualized rate, an investment will roughly double in 10 years, a sensible return for most investors. If investors can double their money in ten years, regardless of what a benchmark is doing, they will see their money double at a reasonable rate. If an investment can consistently return 7.2% rate of return, investors may not need to chase returns in riskier investments to make up for lower returns in inconsistent investments. 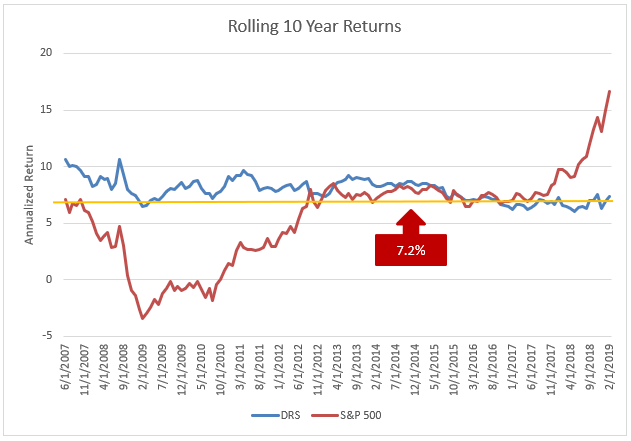 The Defined Risk Strategy (DRS), over its 21-year and 8-month history, has had an average annualized return of 8.01%. At that rate, an investment in the DRS would have doubled in roughly nine years. With an average annualized return, it’s important to acknowledge that there is some variability to long-term returns. Some periods are better or worse than others. The graph below shows the rolling, 10-year returns of the DRS. Source: Swan Global Investments, Zephyr StyleADVISOR. All data based on historical performance of the S&P Total Return Index and the Swan DRS Select Composite. Prior performance is not a guarantee of future results. Despite the exceptionally volatile markets we’ve witnessed over the last two decades, the DRS has displayed a remarkable degree of consistency. The DRS has successfully weathered the two largest bear markets since World War II, when the markets lost almost 45% in the Dot-Com Bust and then over 50% in the Global Financial Crisis. Based upon the Rule of 72, the threshold return required to double an investment in a ten-year period is 7.2%. How many of the DRS’s rolling, ten-year periods have met or exceeded the 7.2% threshold? There have been 141 ten-year periods since July 1997, and the DRS has met or exceeded the 7.2% return hurdle in 103 of them. Almost three quarters of the time the DRS was able to meet or surpass the 7.2% annualized return required to double an investment in ten years. But what if someone had terrible timing with the DRS? What if someone invested in on June 1st, 2008, and experienced the worst 10-year period in the DRS’s history? In that case, the 10-year annualized return was 6.0%. 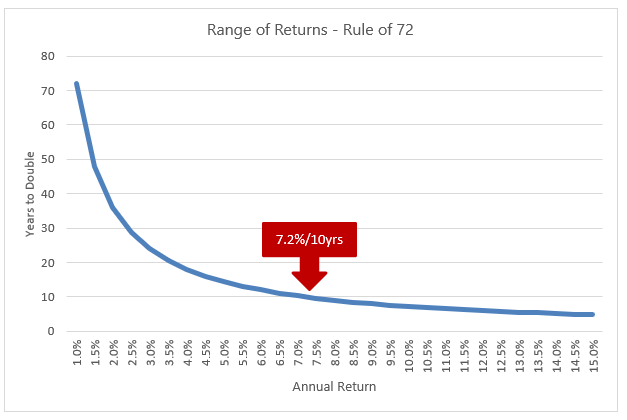 According to the Rule of 72, a 6% trajectory takes 12 years to double an investment. At the end of ten years at a 6% rate of return, a $100 investment would be worth $179. Not ideal, but if that is the absolute worst decade in the DRS’s history, it should be a worst-case scenario most investors are willing to live with, especially compared to potential worst-cases for fixed income or buy-and-hold equities. Finally, much has been made of the recent 10-year anniversary of the bull market, starting in early March 2009. The DRS’s value proposition has always been to provide respectable returns through large, bear-market sell-offs. But what happens if the market doesn’t experience a bear market loss of 20% or more? Can the DRS still deliver? The ten-year return of the DRS through February 28th, 2019 was 7.32%. Even in a period lacking a big, bear market drawdown, the DRS was able to exceed the 7.2% threshold to double an investment over a decade. 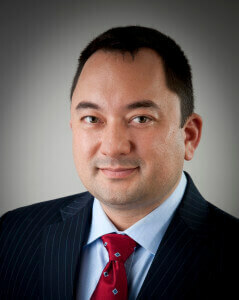 The Defined Risk Strategy has always been designed as a long-term investment strategy. The goal is to build wealth and mitigate the impact of big, bear markets so investors have the money when they need it. Markets tend to be “feast or famine”, either providing very strong or very poor returns, sometimes making it difficult for goals-based financial plans to meet their needs. The DRS attempts to sail between those extremes, providing a decent, respectable rate of return that can harness the power of the Rule of 72 and build wealth. Defined Risk Strategy: A Goals-Based, Full Market Cycle Approach Long-term investors will experience full market cycles, so what matters most is helping them navigating those cycles with the best possible outcome. The DRS is designed to do just that.